Larry Patrick Photography: Just a Great Day! Today’s photo comes from one of my favorite days of the year—Grandparents Day at my grandchildren’s school. The day starts with a mass with the grandparents and grandchildren setting together. After mass, each of the grades make a presentation. Great show by all the classes. JD and I really enjoyed ourselves. 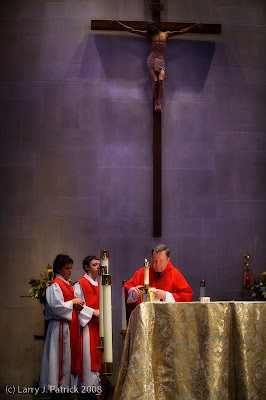 The photo is from the mass. I was interested in the contrast between the cool light falling on the cross and the warm light falling on the priest and alter boys. I do not intend to make any more posting this week. I hope everyone has a good holiday. Camera settings: Nikon D3, Nikon 70-200mm f/2.8 at 70mm with shot at ISO 1,600, f/2.8 and 1/125th of a second. Lightroom—Set white and black points, added mid-tone contrast. Love the contrast between the cool colors in the background and the warm colors in the foreground. The difference helps the viewer focus on your subject. Nice job. Do wish that the one alter boy was not hid behind the candle. The composition with the line of the cross pointing directly at the priest is great. Looking at the photo, I will assume that you had your white balance set to tungsten and as a result the subject looks warm while the crucifix which has some daylight on it looks blue. The light is great and it separates the photo into two distinct parts. I like the composition and lighting. And no noise that I can see at this resolution even at 1600 ISO! This is a great shot. I'll bet you wished you could have gone 60 mm to get the whole cross. That's what you get for sitting on the front row! Nice photo....great why to end a special week. You do have an eye for light. Not sure that I could set in mass and see this one. Not sure what I can add to this but I'll try. White balance and lighting is perfect. I don't see how you could do it any better. Composition is excellent, skin tones right on and it's just a beautiful photo. One that I'm not sure I have ever seen taken inside of a catholic church that was done so well. Wonderful photo. I hope you have offered it to the church for their use. Love the contrasting colors.